This is a little excerpt from a late Victorian book on good manners. The last phrase should be especially noted, as it reveals the source of modern sensibilities regarding engagement rings. “The Responsibilities of a Bridegroom from a pecuniary point of view commence from the moment of his engagement. He must at once present the bride-elect with an engagement ring. A man of even moderate wealth finds no difficulty in choosing and purchasing a handsome ring costing from £50 to £100; but a poor man, possessing but a small income, is often put to more expense than he can conveniently afford in the matter of an engagement ring. He knows all the members of the bride’s family will sit in judgment upon it if it is but a poor bauble worth about £10, which is quite as much as he feels he is justified in spending; he knows that both it and himself will be regarded as very mean, or as conveying a not very inspiriting prospect of days to come. 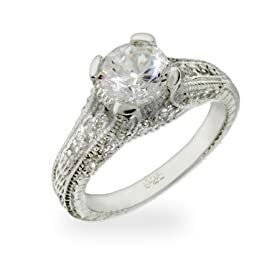 The engagement ring worn on the bride’s finger after marriage is a lasting memento, and if a poor one she will not be proud of it — neither will he. Rich men take the brides to choose engagement rings, expense being no object to them; but poor men cannot do this, as the choice might fall on gems beyond their means, therefore they make the choice themselves, according to the position of the families they are about to enter. If the standing is above their own, from a money point of view, the engagement rings have to be chosen in accordance with the jewels worn by members of such families, and a bridegroom would thus spend £40 at least on an engagement ring suitable to a lady so placed. Next post: Wedding ring engraving – What does it say about you and about the future of your marriage? Previous post: What is a 434 Silver Purity Ring?